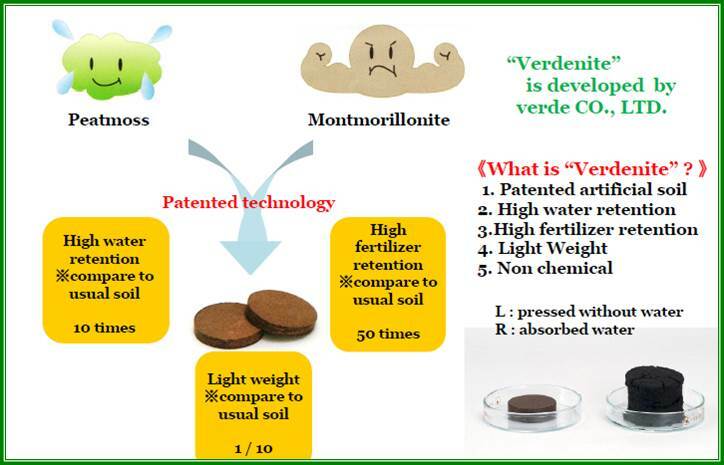 ※“Verdenite” is developed (registered) by Verde Co., Ltd.
"Verdenite” is a product made of peat moss (wet moss) already used all over the world as a soil improvement agent, which is coated with “montmorillonite (commonly called bentonite)”, the highest quality clay with high ion-exchange capacity. In fact, VERDENITE is incomparable and the best non-chemical, environment material for soil in the world, featuring the highly water-absorbing properties and water-holding ability of peat moss and the high fertilizer-holding ability of montmorillonite. VERDENITE tablets are produced by drying and compressing VERDENITE and shaping it into two kinds of tablets: tablets with a diameter of 20 mm and tablets with a diameter of 40 mm. VERDENITE tablets are popular items, which are used as nursery soil for flowers and ornamental plants and as materials for cultivation kits. VERDENITE boards are produced by drying and compressing VERDENITE and shaping it into two sizes of boards. The VERDENITE boards are suitable for placing an admixture of soil in environments where ordinary culture soil is difficult to carry. 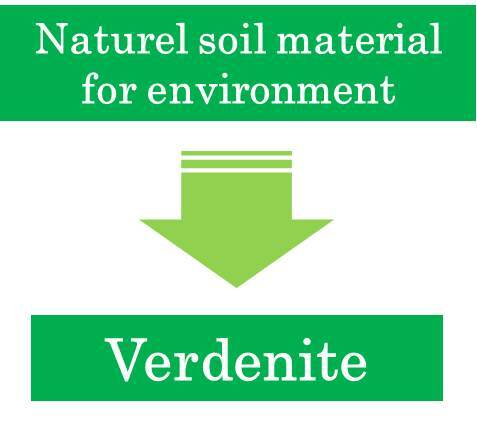 In particular, VERDENITE is extremely close to natural soil as a rooftop greening material. It features no flying off of topsoil and substantial reduction in load, about a half of the load of natural soil even when VERDENITE contains the necessary amount of water. VERDENITE grassboard is a product made of the aforementioned board incorporating lawn grass seeds. The grassboard allows simplification of placement and easy greening. It can be used for aerial seeding work because of its light weight. The VERDENITE board for raising paddy rice seedlings is produced by drying and compressing VERDENITE and shaping it into a board. 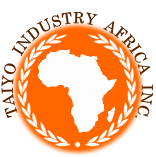 It has realized a reduction in weight (about 420 g) and a reduction in volume compared with the conventional soil for raising paddy rice seedlings (about 5 kg). It weighs about one eleventh to one twelfth the weight of conventional soil for raising paddy rice seedlings or about one ninth the volume. In addition, in the case of VERDENITE board for raising paddy rice seedlings, the frequency of watering can be reduced to once per two or three days compared with once a day in the case of conventional soil. VERDENITE is highly effective for greening deserts, inhibiting desertification, preventing disasters derived from acid rainfall, regenerating barren lands, etc.